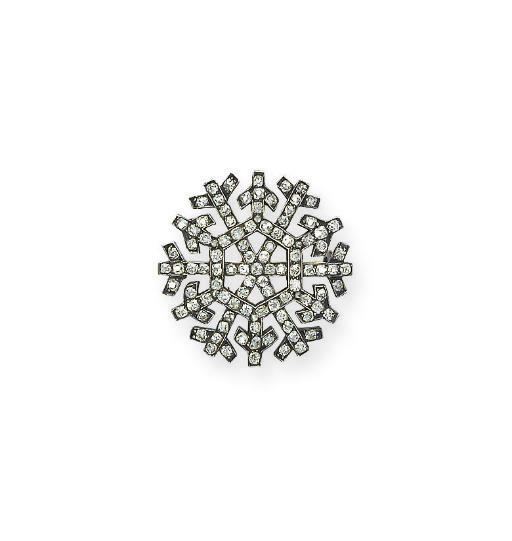 The snowflake motif is arguably Fabergé's most recognisable, symbolic, and evocative design produced in the Holmström workshop. August Wilhelm Holmström (1829-1903) became master in 1857 with his own workshop, and as a senior member of Fabergé's team, was head jeweller. His son, Albert, continued in his father's footsteps after his death, employing the same maker's mark, while Albert's niece, Alma Theresa Pihl (1888-1979), was the creative genius behind the snowflake design. The most famous of her ice and snowflake designs, after the Winter Egg (given by Tsar Nicholas II to the Dowager Empress Maria Feodorovna for Easter 1913, and sold by Christie's New York in April 2002 for the world record sum of $9,579,500 for a Russian work of art) was the series of jewels created for the oil magnate Dr. Emanuel Nobel, one of Fabergé's keenest clients. A notoriously generous host, the story is told how for one dinner party, Nobel conceived of giving all the ladies present an icicle. Pihl was urgently commissioned to make up several small pieces, and drew her inspiration from the ice crystals formed on the workshop window panes. The success of her 'Frost Flower' designs for Nobel was immense, and their production continued for several years in her uncle's workshop. However, less were produced of these iconic designs as generally believed, and today it is a rarity to find one of these very fine designs on the market.